The bilingual hip-hop outfit is ready for massive stages. Los Rakas show off their Oakland pride. At last year's Hiero Day — an annual festival organized by artists who've staked a claim to Oakland's hip-hop legacy — only Los Rakas brought flag-bearers. One bore a red and blue grid with two stars — the flag of Panama. 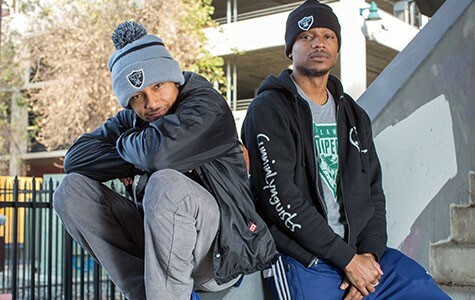 The Oakland-based hip-hop duo sported the colors of their native country, a multicultural image reflected in what the group calls its "PanaBay" sound. Raka Rich (aka Ricardo Gilliam) and Raka Dun (aka Abdull Domínguez) rapped in Spanish and English atop frenetic hip-hop beats peppered with reggaeton and plena flourishes, at once embracing their cultural heritage and vying convincingly to be part of a local hip-hop tradition. "You've never heard of a Panamanian group that raps in Spanish but was born in Oakland, California," said Raka Rich. "We're the first." He sat across from his cousin, Raka Dun, in the Emeryville office of a management company called Ineffable Music Group. A cabal of employees talked about producers and promoters between sips from red plastic cups. Branded gear spilled out of boxes, much of it bearing suave portraits of Los Rakas from the cover of El Negrito Dun Dun & Ricardo, Los Rakas' major label debut. 2014 was a vindicating year for the group. Los Rakas released an album that struck number one on Latin music charts. They created several widely viewed music videos, and contributed a track to Blondie's full-length Ghosts of Download. Still, the duo remained insatiable. A tour with Zion I awaits, along with a recently announced, high-profile appearance at Coachella Music Festival. When asked about their morning, Raka Rich replied, "We went to the bank." Los Rakas have come a long way from the sidewalk in front of Rasputin, where they peddled early wares such as the Panabay Twist mixtape to passersby in the mid-2000s. 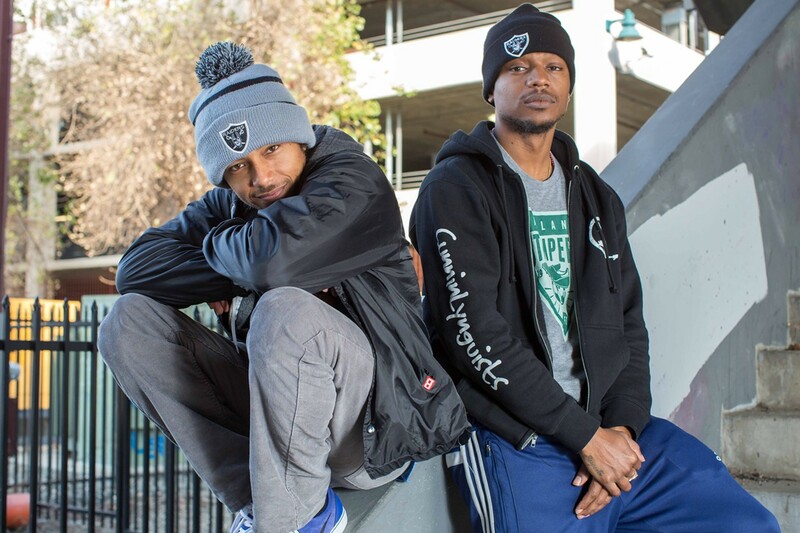 Growing up in East Oakland, Raka Rich and Raka Dun took to online rap battles. They started performing as solo artists, guesting occasionally in each other's sets. Listeners assumed they were a group. "We're cousins," said Raka Rich. "We come from the same background, [and] we understand the same things — the chemistry is automatic." They decided to formalize the partnership on a long drive to Los Angeles. "We had to help our family back home and we decided we could be stronger as a group," Raka Rich remembered. "I start throwing out names, and I'm like, 'Los Rakas.'" In Panama, the phrase is pejorative. "Los Rakas is like, 'ghetto boys.' It's dudes from the barrio. It's not good to be a raka in Panama," Raka Rich said. Which made the phrase powerful. "The urban culture is not embraced there like it is in the United States," Raka Rich continued. "Here, it's like black culture is pop culture. In Latin America, they don't like to embrace where they come from." Los Rakas became a bold tribute to their shared background. "Panama and Oakland have a lot of similarities," said Raka Rich. "Panama is the creator of a lot of slang words in Spanish. Oakland is the creator of a lot of slang. But these two places never get credit for it." In the 2011 music video for "Soy Raka," a signature track whose central sentiment adorns most of Los Rakas' bountiful merchandise, the camera pans from street signs at the intersection of 70th Avenue and Hawley Street toward a black Chrysler parked in the middle of the street. Dancers pour out, undulating and popping appendages from their sockets. Mob vocals repeat, Turf, turf, turf, turf, intoning the name of a dance style steeped in Oakland. Likewise, Los Rakas' 2014 video for "We Dem Rakaz (Hola)," a retooled version of Wiz Khalifa's "We Dem Boyz," exalts scraper bikes. Two-wheeled symbols of Oakland's inexhaustible resourcefulness and style, they're loudly emblazoned with strips of colored foil and spray paint. Raka Rich coasts down a residential street and joins of a crew of scraper cyclists trekking from East to West Oakland. Los Rakas said they'll soon make videos commemorating Panamanian youth culture. For now, the duo is eager for the stage and an audience — especially a massive one. Raka Dun explained the group's assets via an equation: "Our producers are crazy original and we're original on top of that — so we sound like nothing else." Raka Rich seemed intoxicated by the mere mention of Coachella: "We wanna run like the greats. We wanna rock like the biggest to ever do it. We wanna be on the stage like them. We wanna be in the rock 'n' roll hall of fame." While rattling off ambitions, he rose from the chair, gestured emphatically, and bounded across the office as if it was a stage.